Julian Assange, founder of WikiLeaks, categorically denied links between the Russian government and the hacked documents his organization released during the 2016 presidential campaign. We will stipulate that governments regularly spy on each other, and the United States also gathers intelligence on governments such as Russia, China and India. The difference here is that intelligence operations allegedly led to the release of information to the public, via WikiLeaks and media coverage. While Assange — and subsequently, Trump — appear to claim that Russia is 1,000 percent certain not to be the source of the documents published on WikiLeaks, the facts are not nearly as certain. We dug into it. U.S. intelligence officials have formally accused the Russian government of interfering in the 2016 U.S. elections. One of the allegations of Russian involvement is that Russian hackers breached the Democratic National Committee’s network and provided tens of thousands of internal DNC emails to WikiLeaks. CrowdStrike, a cybersecurity firm hired by the DNC, said in June 2016 that Russian hackers had breached the DNC network. After CrowdStrike’s assessment, a hacker named “Guccifer 2.0” publicly claimed credit. “I’m very pleased the company appreciated my skills so highly))) But in fact, it was easy, very easy,” Guccifer 2.0 wrote on its website in June 2016. Then in July, WikiLeaks released thousands of internal DNC emails. Assange did not disclose the source of the leaked emails, but security experts said Russian government hackers may have been involved. After the release, Guccifer 2.0 claimed to be WikiLeaks’s source of the DNC emails. At least two independent cybersecurity firms have confirmed CrowdStrike’s findings that two Russian hacker groups had penetrated the DNC network. One group is believed to have actually stolen and distributed the emails. While the independent analysts suspected that Guccifer 2.0 was linked to the Russian groups that hacked the DNC or were a part of a Russian government influence operation, they did not have hard evidence because the documents were posted anonymously. The FBI is still investigating ties between Russian hackers and the WikiLeaks emails. Then there are the emails of John Podesta, former chairman of the 2016 Hillary Clinton presidential campaign. Private security researchers confirmed that the Russian foreign intelligence service hacked into Podesta’s email account after tricking him to log in to a fake Google log-in page, then leaked the emails. WikiLeaks obtained these emails and published them on its website, but it is less clear as to who exactly sent the Podesta emails to WikiLeaks. We will note that in general, the public should be skeptical of any definitive statements that Assange makes about WikiLeaks sources. WikiLeaks has a longstanding policy of mutual anonymity with its sources, and allows sources to send information through an anonymous drop box. The Russian government has denied links to the DNC hack or the WikiLeaks releases. Guccifer 2.0 claims to be a single individual from Romania unaffiliated with the Russian government. But some experts believe Guccifer 2.0 may comprise multiple hackers of varying levels of expertise. And others have questioned Guccifer 2.0’s proficiency with the Romanian language. Security experts have found links between Guccifer 2.0’s malware and hacking activity similar to known Russian hackers, and assessed that Guccifer 2.0 likely is a Russian denial and deception effort. “Intelligence agencies have identified individuals with connections to the Russian government who provided WikiLeaks with thousands of hacked emails from the Democratic National Committee and others, including Hillary Clinton’s campaign chairman, according to U.S. officials. Those officials described the individuals as actors known to the intelligence community and part of a wider Russian operation to boost Trump and hurt Clinton’s chances,” The Washington Post reported. Susan Hennessey, a fellow in National Security in Governance Studies at the Brookings Institution, said there is an overwhelmingly strong body of evidence that the DNC emails that WikiLeaks published are tied to Russian sources. The U.S. intelligence community tends to be conservative in making public attributions, she said. Other analysts are still skeptical that the Russian government was involved in WikiLeaks, or that Guccifer 2.0 is associated with Russian intelligence. In a December 2016 article, The Intercept wrote that there is not enough evidence to prove Russia hacked the DNC, or that Guccifer 2.0 is, indeed, linked to Russia. Assange assured the American public that he is 1,000 percent confident that the Russian government, or anybody associated with Russia, was not the source of hacked DNC emails published on WikiLeaks. But the situation is much less certain than he makes it seem. Guccifer 2.0, a hacking entity, has claimed credit for providing the hacked DNC emails to WikiLeaks. Independent cybersecurity experts have found Guccifer 2.0’s links to Russian hackers, noting that Guccifer 2.0’s malware and hacking activity are similar to known Russian hackers. Researchers have assessed that Guccifer 2.0 likely is connected to Russians. But Guccifer 2.0 has denied ties to the Russian government. Assange assured the public that he is 1,000 percent sure that there was no Russian involvement, without providing any evidence in the interview or in response to our inquiry. The facts we know contradict Assange’s assurance, and the situation is much too complex for him to make such a sweeping statement. Further, he does not disclose any of the independent assessments that have been made about Guccifer 2.0, who has claimed credit for providing WikiLeaks with DNC emails. 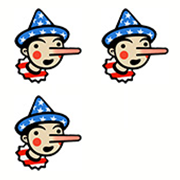 We award Assange Three Pinocchios for his distortion of the facts. Obviously, we will also keep an eye on this and update as further information becomes available. in an interview on Fox News "Hannity"